PHYSEDGAMES | …click a category above for great P.E. games! The PE games you will find on this site are used by professional physical education teachers as part of successful programs in elementary gyms. This games library resource contains some of the best ideas for P.E. games and activities. Simply enjoy the quick and easy video descriptions to learn a new game for your physed class! Remember that children need a minimum of 90 minutes of quality exercise every day, so take a quick look at some games that will get them motivated and engaged to achieve that! PhysedGames is frequently updated with new ideas to try out. We also offer a couple book options (hardcopy and electronic) to add to your physical education library. These book options convert many of the best game videos into more portable text-based and electronic forms. PLEASE NOTE that all games are firstly and always available for FREE in the video viewing format. 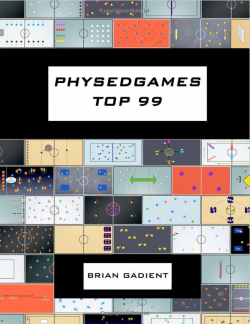 For those interested, take a look at the popular PHYSEDGAMES TOP 99PHYSEDGAMES TOP 99 hardcopy book from Amazon or get top-rated Digital File Downloads (PDFs) on Teachers Pay Teachers. A big THANK-YOU goes out to those who support PHYSEDGAMES! Looking for some classic physical education ideas? Looking for something new and unique? There are all types of games & activities ranging from sport-specific (soccer, baseball, basketball, volleyball, lead-ups, etc) to LOG’s, tag, warm-up, fitness, team-building, dodgeball, literacy, numeracy, etc. Hopefully you will find something here to help supplement your program. All of the games have been tried, tested, and proven to be fun and effective in getting students moving and enjoying learning skills in the gym. If you have a favorite PE activity or game idea that you use in your own program and you’d like to share, please send a detailed email to us at physedgames@gmail.com and we will do our best to create a video to add to the list. Also check out Cap’n Pete’s amazing resources and ThePhysicalEducator for many other great online physical education resources!